Pu Erh from the Chinese Yunnan province, with the leaves pressed into little balls. The slighlty earthy taste is very delicate, enriched with a significant taste of walnut and sweetness. the colour of the infusion, depending on the steeping parametres, may be from brown to dark-brown. One serving of the leaves (one ball) may be steeped multiple times. Our suggestion is one ball per teacup. Brewing: 1 teaspoon (2-3g) for 150ml, 96°C, 3-­5 minutes. 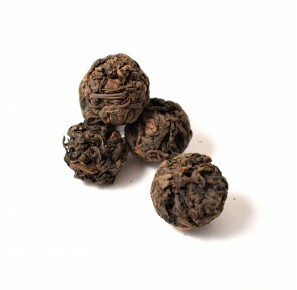 Pu Erh dark tea (read: Pu-er) has been cultivated in China for over 1700 years. 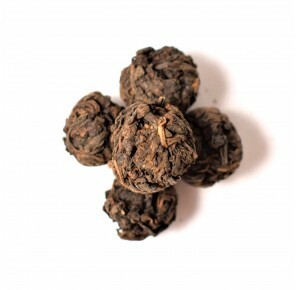 The tea owes its name to the Puer City in Yunnan Province (Southern China), where the tea has been brought to the market from the mountain harvests in the vicinity of Simao and Xishuangbanna. The Pu Erh tea is a typical product of Yunnan Province, where special species of the tea tree can be found. Pu Erh dark tea is manufactured with a traditional process, which also happens to be one-of-a-kind. Even though many centuries have passed since the times of Tang Dynasty (when this tea has been originally discovered), the exact details of the manufacture process remain unknown. Scientists believe that Pu Erh tea gains its medicinal properties as well as its unique aroma thanks to the fermentation process. The dried leaves can even reach the age of 60 years. Its health effects are all the stronger, the more the leaves are allowed to grow in proper conditions. 10 quality categories of this tea exist. 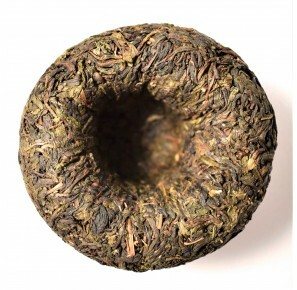 The best among them is whole leaf Pu Erh, which possesses a delicate aroma and high efficiency. Americans have nicknamed Pu Erh as "Fat Killer"
Research conducted in France proves, that 88% of patients who drank Pu Erh tea regularly have lost from 3 to 10kg during a month. The weight loss has occurred with their ordinary diets. Chemical compounds contained within the Pu Erh tea activate nutritional enzymes to secrete digestive juices and stimulate the peristalsis of intestines. All these attributes affect the fat metabolism, which also increases the metabolism of fat gathered within the subcutaneous tissue. Pu Erh differentiates itself from other teas with a high amount of flavonoids, which give this tea a characteristic taste and an earthy aroma. Contains numerous precious amino acids and bioelements.